Added on April 7, 2019 by the ikebana shop. Surprise! 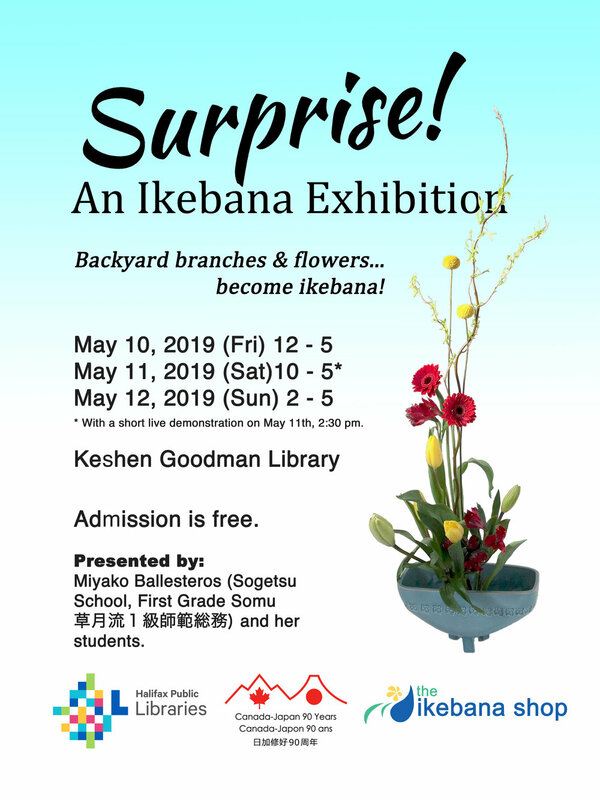 - An Ikebana Exhibition will be held at the Keshen Goodman Library lobby on Mothers’ Day weekend (May 10-12, 2019). Ikebana is the art of Japanese floral arrangement. This year’s theme is “surprise”. The exhibition hopefully will surprise you with ideas on what you can do with the blooms and branches in your backyard! This event is part of the 90th anniversary celebration of Canada-Japan diplomatic relations. The exhibition will be presented by Miyako Ballesteros (Sogetsu School of Ikebana) and her students. Please come and enjoy the ikebana. May 10th (Fri) 12 - 5 p.m.
May 12th (Sun) 2 - 5 p.m.
*Short live demonstration on Saturday, 2:30 p.m.